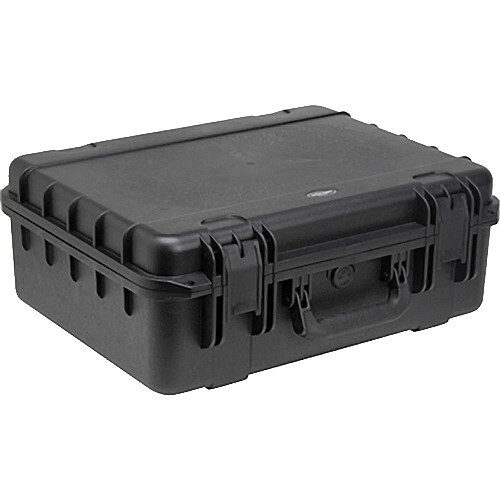 The SKB 3I-2015-7B-C Mil-Std Waterproof Case 7" Deep (Black) is an injection molded ultra high-strength polypropylene copolymer resin case. It features a gasketed, water and dust-tight, submersible design that is resistant to corrosion and impact damage. The case is ATA category 1 rated. There is a continuous molded-in hinge, "trigger release" latch system, comfortable, and automatic ambient pressure equalization valve. It is transported by snap-down rubber over-molded cushion grip handle. It is resistant to UV, solvents, corrosion, fungus and impact damage, and the cases are lockable with a customer supplied padlock. Box Dimensions (LxWxH) 22.756 x 18.661 x 8.898"
3I-2015-7B-C Mil-Std Waterproof Case 7" Deep (Black) is rated 5.0 out of 5 by 1. Rated 5 out of 5 by Anonymous from GREAT PRODUCT Works AMAZING. It is just what I need to protect all my gear. The customized foam inserts are a huge benefit too.